It began with a flat of tomatoes from Costco. There were about 15 medium sized tomatoes in the box. They looked good, but they tasted like, well, nothing. I couldn't eat them and I couldn't make myself throw them out. Then, in a moment of, maybe not brilliance, but a flash of above average, I decided to make some tomato jam. We love tomato jam with field peas and it had been a while since I had made the sweet condiment. I started by plunging the tomatoes into a boiling water bath for a few minutes to loosen the skins. The whole process is made easier if you core the tomatoes and make a shallow X on the bottom of each one with a knife before putting them in the hot water. Once the tomatoes were peeled, I placed them in a saucepan with 2 cups sugar, 1/2 t. salt and 1/2 t. pepper. Then I cooked them on medium heat until the tomatoes were broken down, thick and jammy. It takes a while. Just stir frequently to make sure they don't burn and to help them break up. Remove from the heat and add the juice from 1/2 a lemon. Then pour the jam into clean canning jars. I ended up with a quart of jam plus a half pint. Place the jars in the refrigerator after they cool. I remembered seeing an Epicurious recipe for some rosemary shortbread cookies filled with tomato jam. 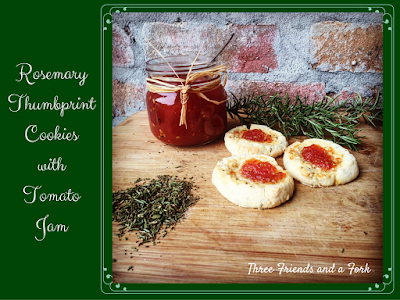 I have tons of rosemary growing in my garden and I happen to be a big fan of shortbread, so I decided to adapt the cookies from sandwich to thumbprint. I feel that sandwich cookies can be too much and I just prefer a thumbprint cookie. So, I took the Epicurous shortbread recipe, made thumbprint cookies and filled them with my tomato jam. To make the shortbread, begin by chopping fresh rosemary very finely. You are going to need a heaping tablespoon of chopped rosemary. Preheat the oven to 350 degrees. Line cookie sheets with parchment paper. In a stand mixer, blend 1 cup of room temperature butter with 1/2 cup sugar until smooth and fluffy. Add two large egg yolks and the chopped rosemary and mix well. In a separate bowl, combine 1/4 cup plain yellow cornmeal, 2 cups all purpose flour and 1/2 t. salt. Add to butter mixture and mix until the dough holds together. Remove from bowl and shape into two 6" logs. Wrap each in plastic wrap and chill for at least an hour. When dough is well chilled, remove from refrigerator and slice into quarter inch sized discs. Place on cookie sheet about one inch apart. Make a dent in each disc with your thumb and fill with small amount of tomato jam. Bake about 12-15 minutes until the cookies are lightly browned. Remove from oven and cool on wire racks. Then try to eat just one! My husband decided these were a great breakfast cookie with a slice of crispy bacon. I think they are good any time of day. Get a printable copy of these recipes HERE.